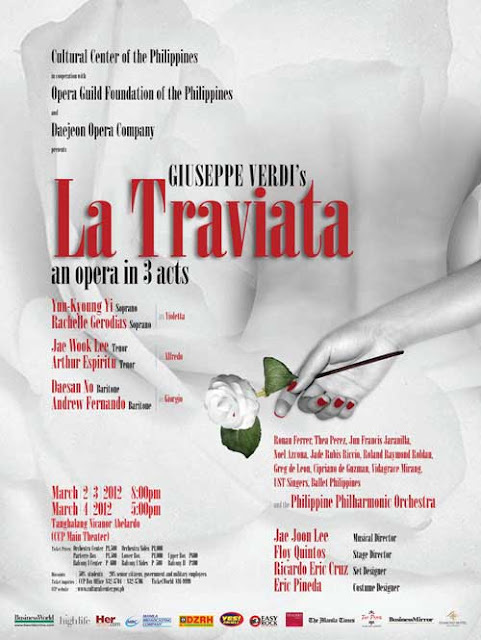 THE Cultural Center of the Philippines in cooperation with the Opera Guild Foundation of the Philippines, and Daejeon Opera Company of Korea will present the well-loved Italian opera La Traviata by Giuseppe Verdi on March 2-4, 2012 at the CCP Main Theater. A stellar cast led by multi awarded Korean soprano Yun-Kyoung Yi, Korean baritone Daesan No, Korean tenor JaeWook Lee and Filipino opera stars Rachelle Gerodias, Andrew Fernando, and La Scala tenor Arthur Espiritu will essay the title roles of Violetta, Alfredo and Germont. The Philippine Philharmonic Orchestra, under the baton of Prof. Jae Joon Lee, will provide live orchestral music, while the internationally awarded UST Singers will render choral support. Floy Quintos directs the production with set design by Ricardo Eric Cruz and costume design by Eric Pineda. La Traviata, an opera in three acts, is best remembered for the widely performed Libiamo ne’lieti calici (The Drinking Song), Addio Passato, and Sempre Libera. La Traviata is the story of a beautiful but doomed prostitute. Composed by Verdi and set to an Italian libretto by Francesco Maria Piave, it premiered on March 6, 1853 at the La Fenice Opera House in Venice. The opera was said to have failed at its premiere but attained success in the same city a year later, and went on to become a timeless classic as one of the world’s most popular operas, second only to Mozart’s The Magic Flute. A 2nd prize winner of the Bellini International Voice Competition in Italy, Yun-Kyoung Yi has performed the lead parts in La Traviata, Lucia di Lammermoor, Rigoletto, and La Boheme, among others. Yun-Kyoung Yi graduated from Keimyung University, majoring in Voice in 2000. She took her graduate degree also at Keimyung in 2003 and earned two diplomas from ARENA accademia and AIDM accademia in Italy in 2007. She is currently a visiting professor at her alma mater Keimyung University. 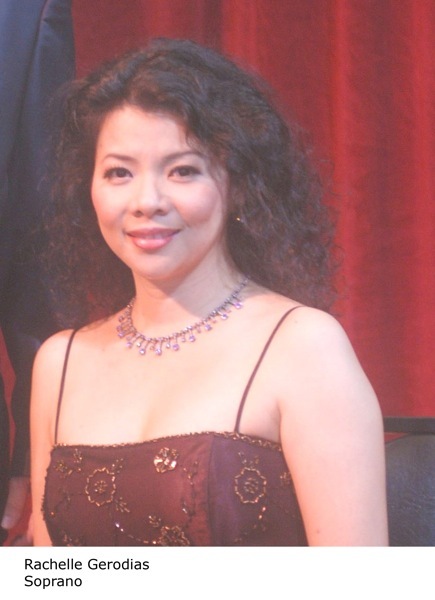 Soprano Maria Rachelle Gerodias is one of the Philippines’ most awarded sopranos. She received her Master’s Degree in Vocal Performance and Vocal Literature from the famed Eastman School of Music in Rochester, New York. She holds a Professional Diploma in Operatic studies from the prestigious Hong Kong Academy for Performing Arts. She made her European debut in the role of Liu in Puccini’s Turandot at the Volskoper Wien in Vienna, Austria. 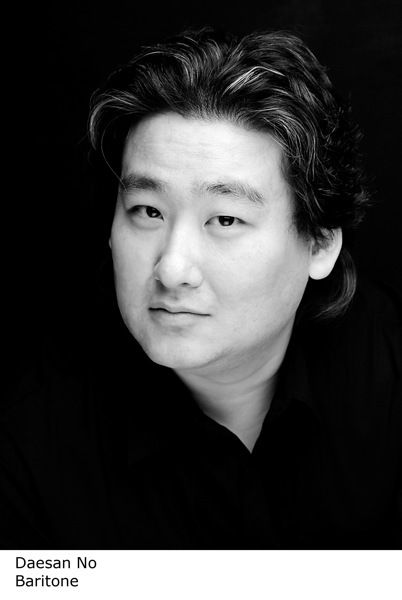 Jae Wook Lee has performed in various concerts all over the world, including the Philippines, in lead roles of operas such as La Traviata, Rigoletto, Nabucco, La Boheme, Madama Butterfly, and Tosca, among others. Lee is an award winning singer, having bagged top prizes in the Korean National Vocal Music Competition, Montserrat Cabelle, Rosetum and Nino Carta international vocal competitions. 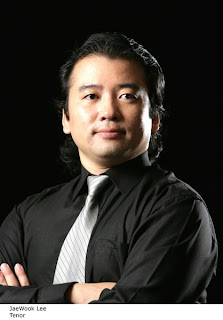 Filipino-American tenor Arthur Espiritu is the winner of the 2009 George London Award and the La Scala Award. He received an Artist Diploma from Oberlin College Conservatory of Music and earned both a Bachelor of Arts and a Master of Music degree from the University of New Orleans. Daesan No’s opera credits include the title role in Falstaff and Rigoletto and the roles of Leporello in Don Giovanni, Bonze and Yamadori in Madama Butterfly, Scarpia in Tosca, Escamillo and Marcello in Carmen. He has won numerous awards, one of which was the Placido Domingo Fellowship Award at the Academy of Vocal Arts. Daesan No earned his Graduate Performance Diploma and Master of Music Degree from the Peabody Conservatory in Baltimore. Filipino bass baritone Andrew Fernando completed his Professional Diploma and Professional Certificate in Opera Performance at the Hong Kong Academy of Performing Arts where he was awarded a full scholarship. Fernando is an Opera Pacific Resident Artist for which he has sung many roles including Friedrich Bhaer in Little Women, Marullo in Rigoletto, Masetto in Don Giovanni, Zaretsky in Eugene Onegin and a Prison Guard in Dead Man Walking. La Traviata is the first of three opera events to be held at the CCP. Madame Butterfly, co-produced with Music Artes of Jay Glorioso, is scheduled for June, while Barber of Seville, co-produced with Rustan’s, Philippine Italian Association, and the Italian Embassy, is slated for July 12-15. For more information, please call the CCP Box Office at (632) 832-1125 loc. 1409, 832-3704.